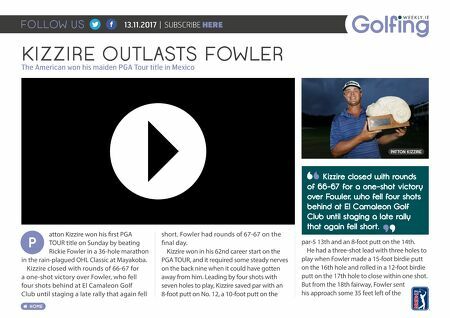 FOLLOW US HOME 13.11.2017 | SUBSCRIBE HERE KIZZIRE OUTLASTS FOWLER The American won his maiden PGA Tour title in Mexico PATTON KIZZIRE atton Kizzire won his first PGA TOUR title on Sunday by beating Rickie Fowler in a 36-hole marathon in the rain-plagued OHL Classic at Mayakoba. Kizzire closed with rounds of 66-67 for a one-shot victory over Fowler, who fell four shots behind at El Camaleon Golf Club until staging a late rally that again fell short. Fowler had rounds of 67-67 on the final day. Kizzire won in his 62nd career start on the PGA TOUR, and it required some steady nerves on the back nine when it could have gotten away from him. Leading by four shots with seven holes to play, Kizzire saved par with an 8-foot putt on No. 12, a 10-foot putt on the par-5 13th and an 8-foot putt on the 14th. He had a three-shot lead with three holes to play when Fowler made a 15-foot birdie putt on the 16th hole and rolled in a 12-foot birdie putt on the 17th hole to close within one shot. But from the 18th fairway, Fowler sent his approach some 35 feet left of the P Kizzire closed with rounds of 66-67 for a one-shot victory over Fowler, who fell four shots behind at El Camaleon Golf Club until staging a late rally that again fell short.